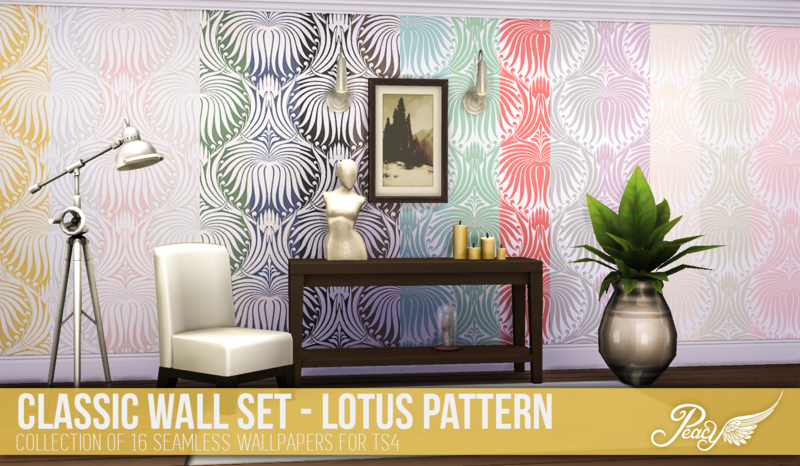 Here is part 4 of my Classic Wall set for TS4. Now you see where I lost my mind. I loved the wallpapers I made, but I don't like to mix and match styles. Since the walls had custom cornices and kickboards, I had to have solid coloured walls to match. The dilemma? What colours should I choose? Well I chose 60 colours. Yes 60. I am not kidding. Don't laugh. 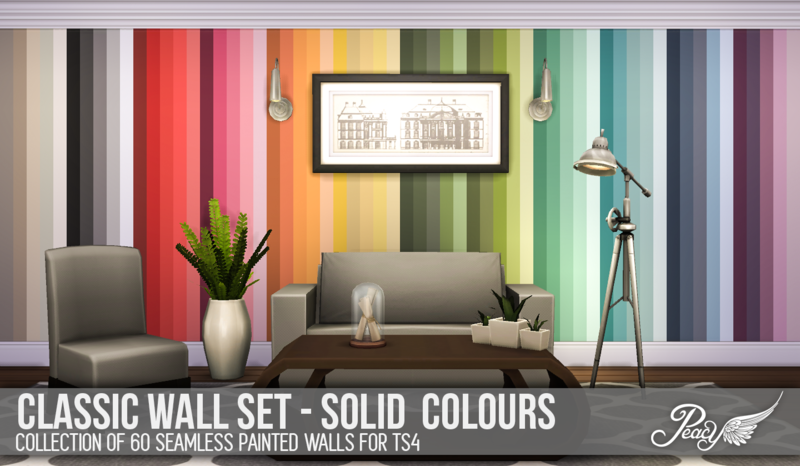 But it does sum up the classic wall set for now (I might revisit it later to add dado rail versions for the colours) where I made 400 image files just to get the 4 sets in-game. It was worth it, but it was a lot of work. Note: These walls are NOT scaled to EA's wall texture sizes. I wish to maintain the quality of the texture and this cannot be done so with EA's texture sizes. Some people experience a bug where the unscaled walls show up as a texture with a question mark. So be aware that if you download these walls and experience the glitch, these walls are not for you. I have no plans to scale the texture down because of the loss of quality. The archive contains the 6 package files and preview images. Just place in your mods folder and look for them in your game. I hope you enjoy. 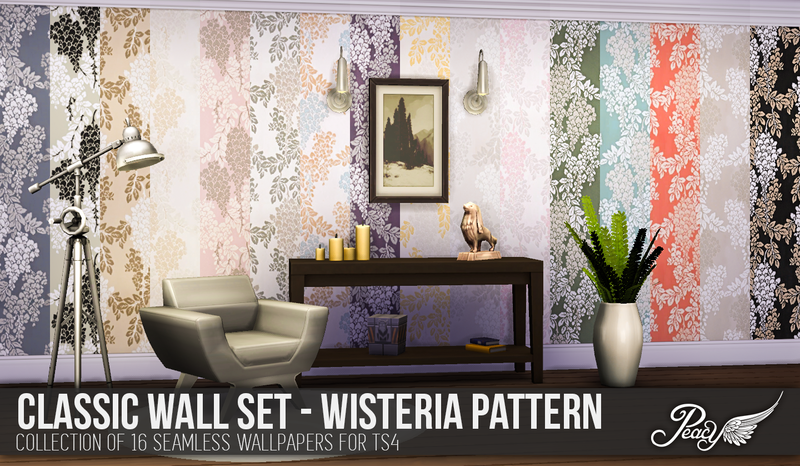 Here is part 3 of my Classic Wall set for TS4. Do you see how this project kept growing? I love wallpapers and matching walls, so I had to have another wallpaper choice. This birch woodland pattern is one of my favourites. And again, I had to have colour variants. This time only 8, I was behaving myself. Don't let that fool you, I went all the way on the next set. The archive contains the package file and preview image. Just place in your mods folder and look for it in your game. I hope you enjoy. 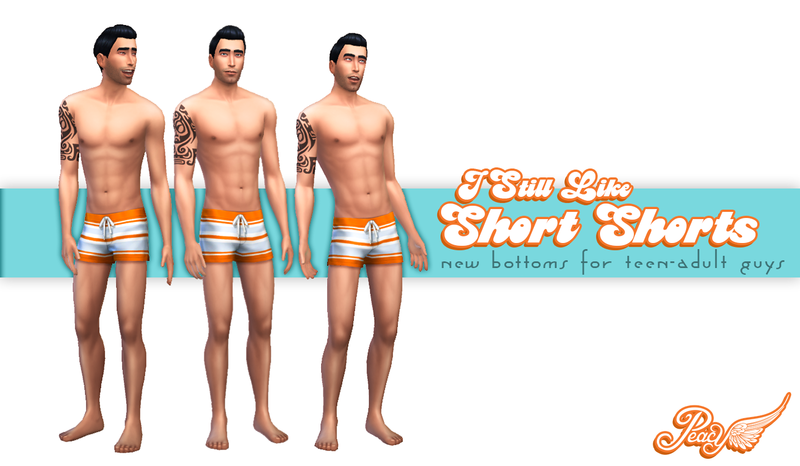 Hi there my fellow simmers! today I bring one of my biggest projects to date for TS4. 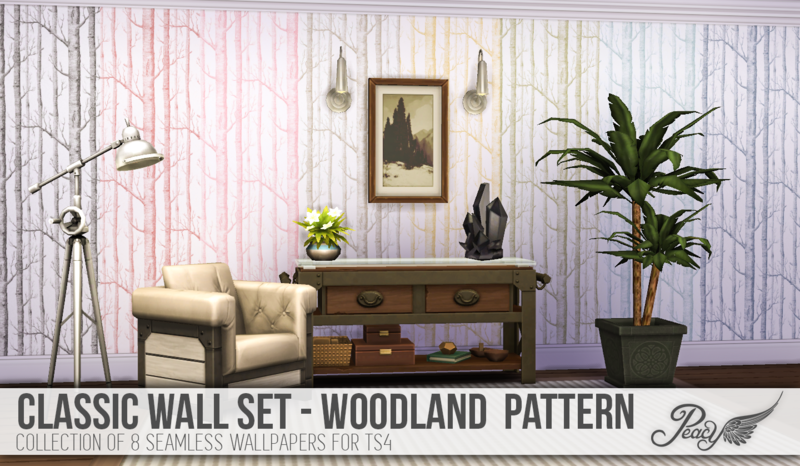 One of my favourite walls from TS3 was my Classic Wall Set (found here) so I decided when WallEz came out I would convert them to TS4 then it all got out of hand. After changing to S4S when they added wall functionality and the ability to edit normalmaps and speculars, I decided I wanted a full set of walls to match. 400 image files, 9 wall sets, and lots of time in PS, I am finally ready to share them with all of you. This first set is one of my favourite RL wallpapers by Farrow and Ball converted for game use in an array of colours. I hope you enjoy them as much as me. It has been brought to my attention that some people seem to be experience crashing, either selecting it in CAS or when exiting. This seems to be an isolated issue that only affects some games, so I have no clue what is causing it. My guess is it is because some of the tools are always being updated and bugs are still being worked out. For those of you who have the tee installed and it works fine, you can keep it installed. But for those that are having issues (and possibly with other content from other creators), it may be best for you to remove the package for now. If I knew what is causing the crashing issue, I would fix it straight away, unfortunately I do not. I will have to investigate and ask some of the modders if they know the cause, and if it can be fixed, but at the present time there is no other options. Sorry for the inconvenience. Hello my fellow simmers! Today I bring you a new top for your guys. 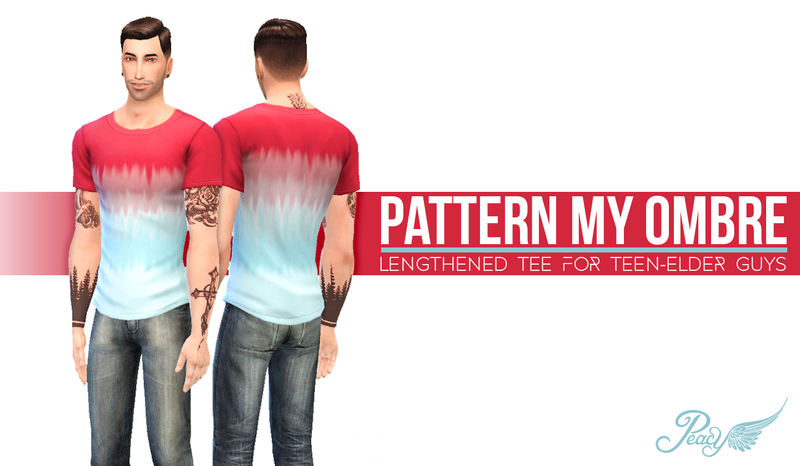 This is actually a mesh edit, I took the standard tee and lengthened and reshaped it a bit as well as retexturing it a bit to give it a looser collar and more detailed fabric folds. I also love the ombre effect, but I wanted mine to be a bit different, hence the patterns. I really love these, so I hope you do too. 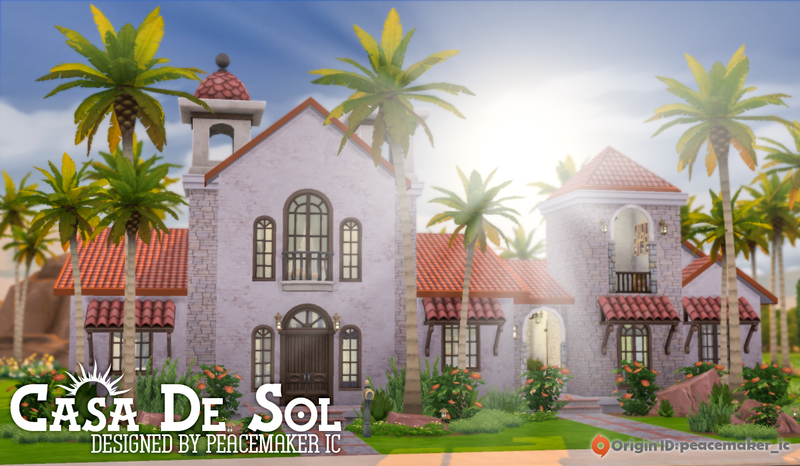 Casa De Sol is quite a quaint, yet imposing home built in a Mediterranean style to fit into Oasis Springs. With its rustic charm and a little bit of zing from the contemporary traditional interior, it fits well in the neighbourhood while standing out for its uniqueness. Featuring 4 bedrooms, 3 bathrooms, open plan main kitchen, kitchenette, art room and alfresco area split across the main home and an annex, Casa De Sol is perfect for a multi-generation family. Built on a 30x40 lot (location can be seen in the map image), it costs $199, 417 and can be found in the gallery under my Origin Id: peacemaker_ic, or the hashtags #PeacemakerIC, #SimsationalDesigns, or #CasaDeSol. For those who don't want to dl from the gallery, click on one of the alternate download links below. To install into your game, Extract the archive then navigate to The Sims 4 folder in My Documents. Find the Tray folder and place ALL of the files from the archive into it. Open your game and find the home in your library, just as if you dl'd it directly from the gallery. Yay! 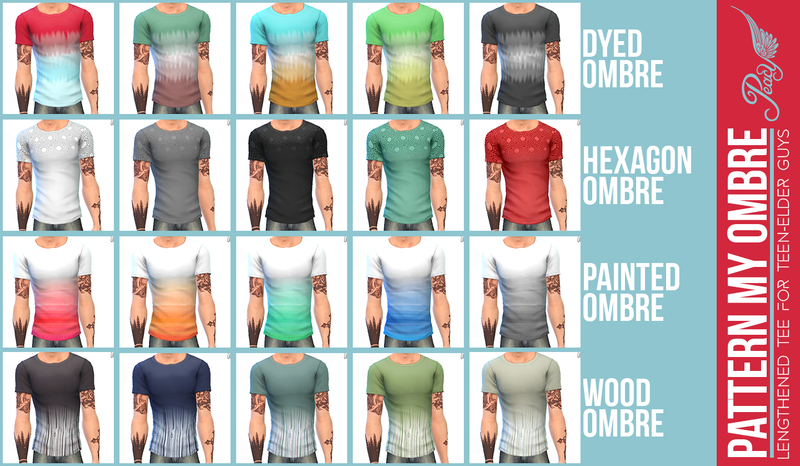 My first TS4 clothing creation! Well, its not new as in a new frankenmesh, but it is a standalone retexture I have made. 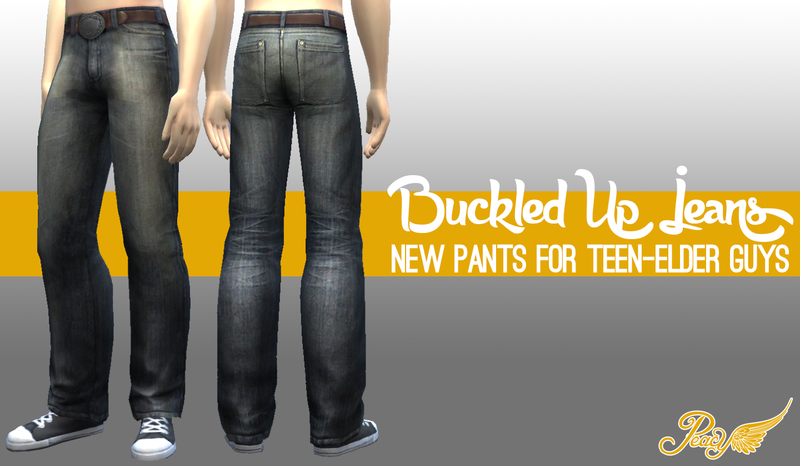 I really love jeans, but the basegame versions aren't very textured so I changed that. 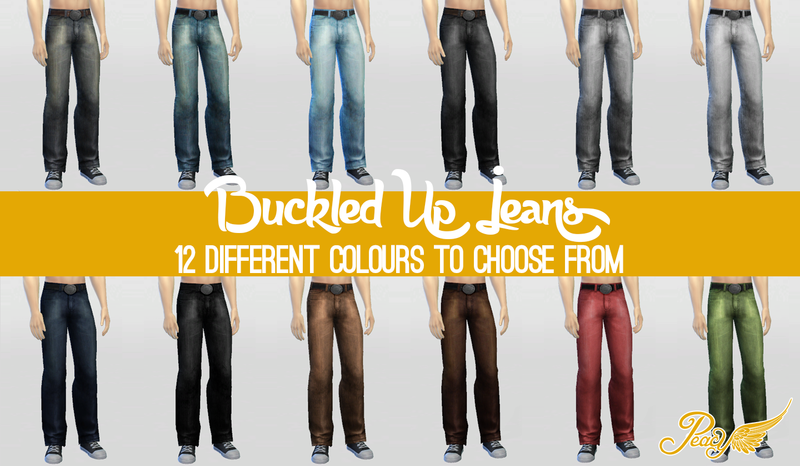 These use a real and sims texture combined to give a unique look that hopefully your sims love. Do note, the higher your settings for sim rendering, the clearer the texture will appear. I took my in-game pictures on the highest possible settings for sim textures and with the "uncompressed sim textures" ticked. These settings give the best possible clarity to textures. If these are blurry, its due to individual game settings just like TS3.